Pro-Fill On-Board Battery Watering System, 6-volt RV Edition, provides the most convenient and accurate means of filling and maintaining proper battery water levels. Water levels in lead acid batteries must be checked on a regular basis - a minimum of every 4 to 6 weeks; more in some climates. Improper water levels will shorten battery life and result in poor performance of batteries, equipment, and battery chargers. Hard to reach batteries are just as easy to fill as batteries on a workbench. Several batteries can be filled safely and simultaneously from a single remote position without ever having to touch a battery or remove a cap. Pro-Fill’s automatic control valves ensure each cell is closed when the precise level is reached. All 6V flooded lead acid batteries with standard 3-cell spacing of 2-11/16" or 3-5/16" center-to-center. Fits all standard 6V lead acid batteries. Eliminates need to remove vent covers to fill. Automatically sends water to low cells only. Installs in minutes, no tools required. Safer and more accurate than conventional filling. Improves battery life and performance. Hard to reach batteries are as simple to fill as batteries on a workbench. Several batteries can be connected and filled at the same time. Automatic shut-off prevents over or under watering. Use with any distilled water container. Quick disconnect feature allows supply to be attached in a snap. No need to remove vent covers. 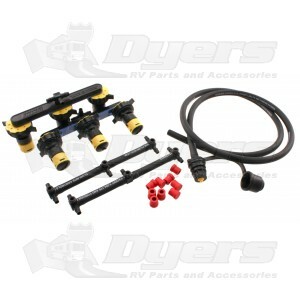 *Comes with two standard spaced rigid manifolds and two universal spaced flexible manifolds. Wish my batteries were maintenance free but since that isn't the case, this setup is the answer. Even if I have a battery on a work bench with plenty of access and light, I would always spill/make a mess and inevitably, white corrosion would follow. Given the location of my coach batteries and all the cables routed in the way, my first thought was that I had to replace the batteries with maintenance free but I decided to try this setup first, Cheaper and easier than replacing the batteries. Installed easily. All replacement cell caps were good and tight fitting with a positive "click" when totally tightened. One cell was very tight and I was afraid that I might break the new cap getting it in but I just put more effort on it and it finally twisted in place. All connections worked as they should. Was kind of miffed that you had to purchase the pump separately but not a big deal. My setup is only on two 6V batteries but pump worked. First time I added about a cup of distilled water to both and bulb became noticeably firm. Time will tell how durable they are. I feel good about having them. Excellent product should have got them long ago it would save me a lot of hassle. Product seems to work ok; want summer temps to see how well batteries are watered. Seems good, fill operation worked. Need summer temps to check operation. I sold my other MH and I wanted to keep these and put them on my new MH but I forgot. These are a must to have as there are a God's blessing when filling he batteries with water. Just connect the rubber hose and pump in water as needed. The shipping was supper also. This product has made my life SO MUCH easier. Seemed pricey but makes maintaining our battery bank a snap. The batteries will last longer and more than make up for the purchase.